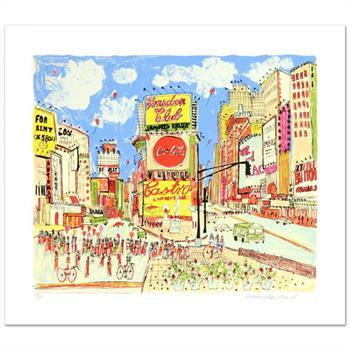 "Times Square" is a limited edition serigraph on paper by Susan Pear Meisel, numbered and hand signed by the artist! Includes Certificate of Authenticity! Measures approx. 35" x 31" (with border), 29" x 25" (image). 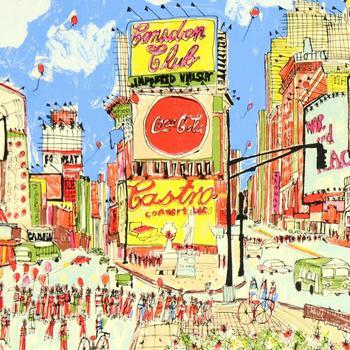 Born in New York in 1947, Susan Meisel's paintings and prints are active in line and color. Meisel's portrayal of group scenes has its roots in the tradition of impressionist artists Maurice Prendergast, Raoul Dufy, and Red Grooms, but her work has evolved to incorporated the aura of a Fragonard garden. One key part to Meisel's prints is her color. 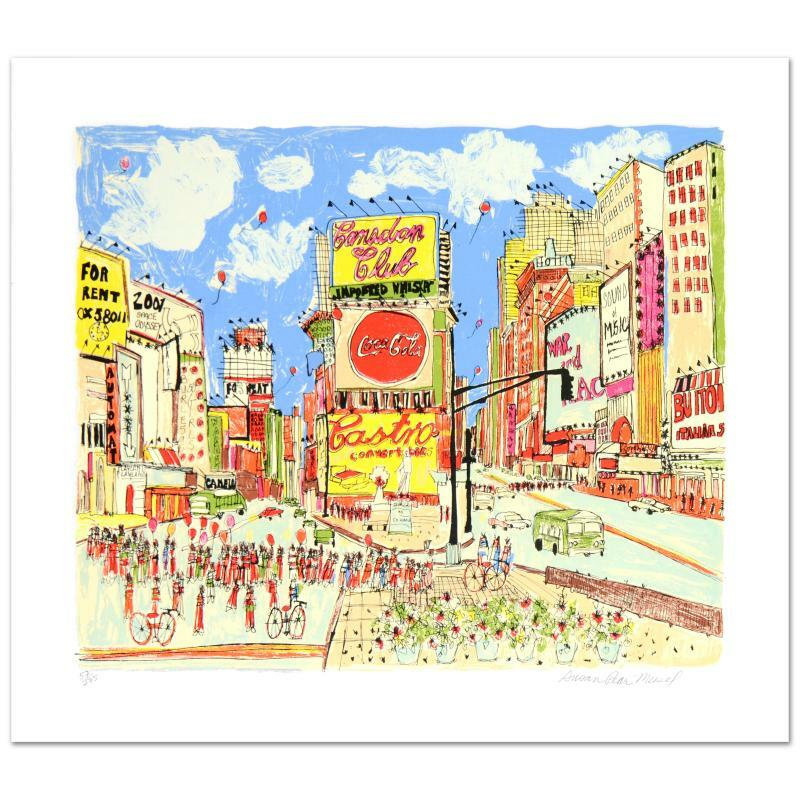 Whether through silkscreen or lithography, the inked hues carry their tonalities to the surface of the paper. The layering of multiple colors builds up a ground pattern that engages with one another in a vibrancy of color. 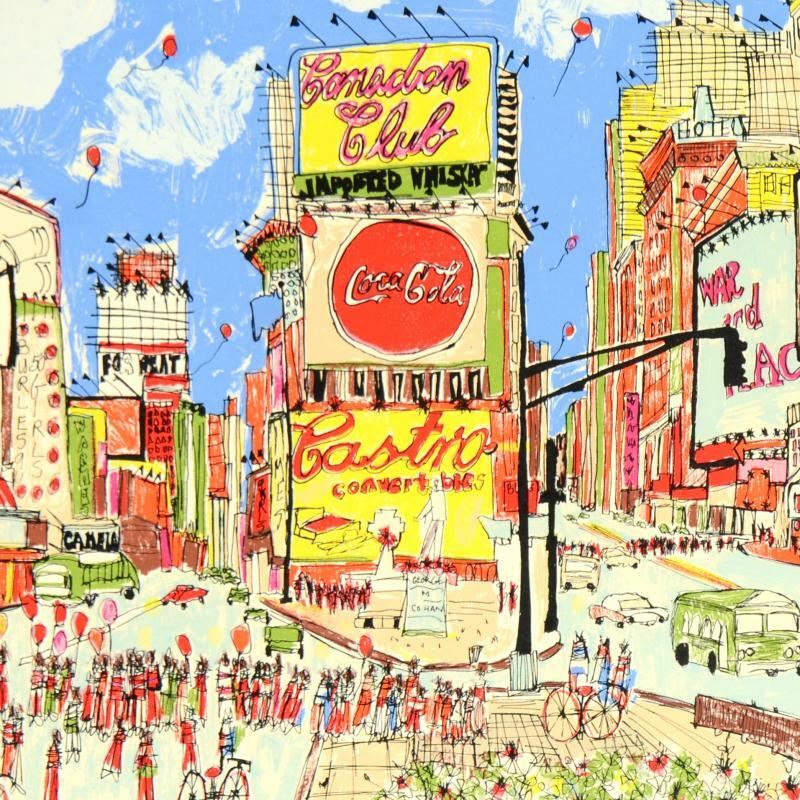 In her earlier prints, the artist's colors are filled with variations of yellows and greens that converse with pinks, reds, and blues on various street scenes such as in "Balducci's" (1970). The compliments of red pitted against green, blue vibrating with orange intensity and active the image in "Changing of the Guard" (1970) and "Spanish Steps" (1970). Susan Meisel's work has been exhibited worldwide and she was commissioned to create Bill Clinton's 1996 Presidential Campaign Poster.